Patrons practice the engineering design process by creating paper rockets that can be launched from a soda straw. They then test, redesign, and do it again! Hints for uses in your library Always practice safety and never allow patrons to project rockets at each other. 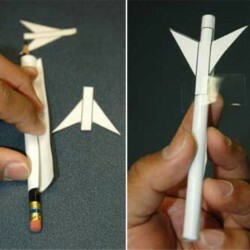 Let students personalize their rockets by drawing on them. What Is a Heavy Lift Launch Vehicle? [Suggest a book] Zoom, rocket, zoom! This was a super simple craft we did in November for Aviation History Month. There wasn't a straight face in the library that evening, everyone was having a great time and laughing. There were little paper rocks all over the place. Very simple and fun craft that everyone can have fun with. We highly recommend.